Nigerian stocks Monday sustained the past weeks’ negative performance as profit-taking further shed benchmark index, the NSEASI, by 0.04 percent to close at 41,454.30 points while year-to-date (YTD) return closed at 8.4 percent. The day’s bearish performance was largely due to profit taking in GUARANTY (-3.4%), UNILEVER (-5.0%) and SEPLAT (-3.0%). Consequently, market capitalisation declined to N15.0 trillion as investors lost N5.9 billion in value. This is despite good corporate releases in the past weeks and analysts calling a market rebound, arguing that the current low valuation on the sustain bearish trade would provide opportunities for bargain hunting. Indeed analysts at Afrinvest had anticipated a rebound this week and have continued with their projections Monday despite the negative performance on the day. “Investor sentiment strengthened, thus we anticipate a rebound in market performance in subsequent sessions as investors continue to seek for bargain opportunities,” they noted in their market report. 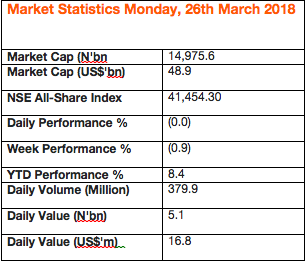 Market activity level Monday weakened as volume and value traded fell 32.2 percent and 24.1 percent to 379.9 million units and N5.1 billion respectively. Top traded stocks by volume were ACCESS (77.9m), ZENITH (58.4m) and UBA (44.0m) while ZENITH (N1.8bn), ACCESS (N885.1m) and NESTLE (N548.3m) were the top traded stocks by value. Performance across sectors was largely bearish as three of five indices trended southwards, while two closed in the green. The oil & gas index led laggards, down 2.5 percent following price depreciation in SEPLAT (-3.0%). The industrial goods index trailed, shedding 2.0 percent due to sell-offs in WAPCO (-4.0%) followed by the banking index, which fell 0.4 percent on the back of losses in GUARANTY (-3.4%) and DIAMOND (-4.7%). On the flipside, the Insurance and Consumer Goods indices gained 1.3% and 0.3% respectively driven by buying interest in NEM (+2.2%), NIGERIAN BREWERIES (+1.9%), NESTLE (+0.2%) and DANGSUGAR (+0.7%). However, investor sentiment, measured by market breadth (advance/decline) ratio, improved to 2.0x from 0.7x recorded the preceding Friday as 34 stocks advanced relative to 17 stocks that declined. The top performing stocks were GLAXOSMITH (+10.0%), CUSTODIAN (+10.0%) and MULTIVERSE (+9.5%) while FORTE (-9.1%), ROYALEX (-6.1%) and UNILEVER (5.0%) were the worst performing stocks.